Aspartame is an artificial sweetener (nonnutritive sweetener) that is roughly 200 times sweeter than sucrose (table sugar). It is used as a replacement for sucrose in more than 6,000 consumer foods and drinks sold worldwide under the trade names Candarel, Equal and NutraSweet. Despite receiving approval across the world, aspartame remains one of the most controversial food additives in use. It is also often included in pharmaceutical drugs and supplements. However, it is less suitable for cooking and baking than other sweeteners, as it is unstable in heat and loses much of its sweetness. Aspartame was discovered in 1965 by a chemist called James M. Schlatter. It was first used as a food additive in the US and some European countries in the early 1980s, but didn’t receive EU-wide approval until 1994. Its popularity has decreased in recent years due to a number of factors, including increasing demand for sucralose, which unlike aspartame retains its sweetness after being heated and has at least twice the shelf life. Other factors include changing consumer preferences, differences in marketing and industry-related conspiracies about its safety. The benefits of Aspartame are related to its taste, its low calorie content and the fact that it doesn’t raise blood glucose levels. Unlike other artificial sweeteners such as saccharin, aspartame does provide calories when metabolized (4 kilocalories of energy per gram - the same as sucrose). However, only a tiny amount of aspartame is needed to produce a sweet taste, which means that its caloric contribution is negligible. The sweetness of aspartame lasts longer than that of sucrose. For this reason, it is often blended with other artificial sweeteners such as acesulfame potassium to produce an overall taste that is more similar to sugar. Aspartame contains zero carbohydrates and therefore does not impact upon blood glucose levels. There are several disadvantages of aspartame, with the safety of aspartame the source of much media coverage and speculation. Aspartame gets metabolised by the body, meaning it doesn't get excreted in the same form upon ingestion. For this reason it must be avoided by people with the metabolism disorder phenylketonuria (PKU), which is a rare inherited disease that prevents phenylalanine - an essential amino acid - from being properly metabolised. In the UK, the Food Standards Agency requires all foods that contain aspartame to list the chemical among the product's ingredients and carry the following warning; "Contains a source of phenylalanine". Manufacturers of aspartame-sweetened products must also include '"with sweetener(s)" on the label close to the main product name, or "with sugar and sweetener(s)" on foods that contain both sugar and sweetener. In the United States, foods containing aspartame must have "Phenylketonurics: Contains Phenylalanine" written on their labels. Medical experts, including Dr John Olney, a leading researcher into neuropsychopharmacology has raised serious concerns about neurotoxic effects of aspartame. Official reviews carried out by the US’ Food and Drug Administration and the European Food Safety Authority report that there is no consistent evidence of harm in humans. 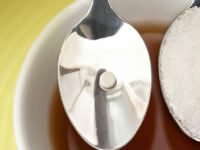 Despite being declared safe, a number of leading academics have still expressed doubts over the safety of the sweetener. Aspartame has been the subject of several political and medical controversies and health scares since its approval for use, with many websites, books, and articles claiming aspartame poses a health risk. Aspartame has been the subject of several political and medical controversies, internet hoaxes and health scares since its approval for use, with many websites, books, and articles claiming aspartame poses a health risk. Research and safety tests on aspartame in the past have been marred by allegations of conflicts of interest in those studies, leading to question marks over the way in which its approval was obtained. However, The U.S. Government Accountability Office conducted reviews of the actions of employees working for the companies responsible for the testing and distribution of aspartame in 1986 and the approval process in 1987, and found no evidence to support the allegations. In 1998, a widely circulated email hoax warned of serious health hazards attributed to the ingestion of aspartame. The email claimed the artificial sweetener was toxic to humans in a hundred different ways, and even coined a new medical term for these effects; "aspartame disease”. In response to the email/book claims, the United States’ Department of Health conducted an investigation which found no significant epidemiological links to serious risk or harm. Despite all the controversy surrounding aspartame, it has been approved for use in over 100 countries. In 2002, the European Scientific Committee on Food conducted a review of more than 500 subsequent safety studies. It concluded that the acceptable daily intake (ADI) of 40 mg/kg of body weight of aspartame was entirely safe - except for people with the genetic condition phenylketonuria (PKU). In 2006, the European Food Safety Authority reported that the previously established ADI was appropriate, after reviewing yet another set of studies, while a medical review by the U.S Food and Drug Administration in 2007 concluded that "the weight of existing scientific evidence indicates that aspartame is safe at current levels of consumption as a non-nutritive sweetener".